I like to make things that are practical. 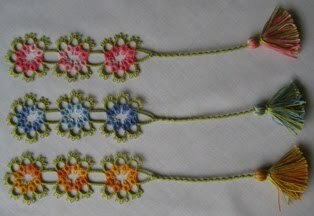 Tatting bookmarks is one of my 'practical' creative activities. 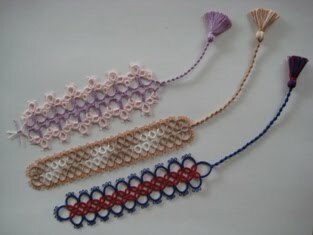 They are useful and make special presents for friends and colleagues. Because they don't take too long to make, I can finish one within 5 train trips.!! I usually tat a bookmark on the way home from work by train, the trip takes about 1 hour. It helps with distracting me from constantly thinking about work. Four of the bookmarks in the pictures won first, second and third prizes at 2009 and 2010 Castle Hill Shows, Sydney. They are lovely, Em! Do you get a lot of comments on the train? Very few comments for reasons; there are few people around where I usually sit on the train home and I don't look up to see who is watching. I guess if I would tat on the way to work, it would be a different story. 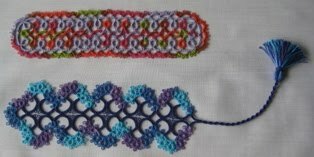 I normally start working on the train to work or read and no tatting as the train is quite crowded.